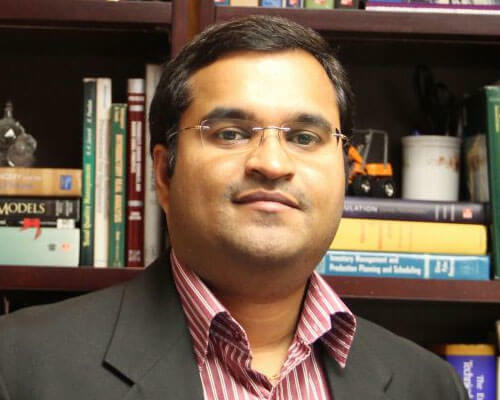 Home » Academics » Schools » School of Science, Engineering and Technology » Faculty » Gopalakrishnan Easwaran, Ph.D.
Gopalakrishnan Easwaran, Ph.D., has a bachelor’s degree in mechanical engineering from PSG College of Technology. He earned his master’s and doctoral degrees in industrial and systems engineering from Texas A&M University. Easwaran has industry experience from consultancy research projects for a variety of firms and government organizations including Master Halco, Frito-Lay, PepsiCo, City of San Antonio, NatureSweet, UPS, Fiesta Warehousing and Distribution, Season Group, and the South Texas Veterans Health Care System. He has published papers in peer-reviewed journals such as Interfaces, Naval Research Logistics, IIE Transactions and Transportation Science. He referees research articles for internationally reputed journals such as the European Journal of Operational Research, Decision Sciences, Journal of Operational Research Society, Computers & Operations Research, Computers & Industrial Engineering, and Applied Math and Computation. He is also a member of the Institute for Operations Research and Management Sciences. Easwaran has served as the faculty adviser for the St. Mary’s IIE Student Chapter since fall 2012. Easwaran has served as a mentor for students with McNair scholarship and Summer Undergraduate Research Fellowship at St. Mary’s University. He is one of the organizers of the Pre-Engineering Summer Program at St. Mary’s and he is involved in teaching Operations Research techniques to high School students. His research interests include supply chain management, international logistics, applied optimization, business intelligence and analytics, scheduling and sequencing, revenue management, and high performance computing. Easwaran and his research team that worked on supply chain optimization for Frito-Lay was a finalist in the Daniel H. Wagner Prize for Excellence in Operations Research Practice. Easwaran’s logistics optimization research for the Solid Waste Management Department of the City of San Antonio was featured in the San Antonio Express-News. Also, his research publication on closed-loop supply chain network design was highlighted in IIE Transactions.